More detail: where to ride dirt. And…check the blog entries for the motorcycling category, where you’ll find all sorts of detail. Motorcycles hooked me at 16. A friend loaned me his little Yamaha trailbike and told me to drive as long as I wanted. I took him literally—2-1/2 hours! My dad and friend weren’t happy but I paid them no attention. I had found a new love! Here I am on U.S. 550 just north of Red Mountain Pass. The bike is my Yamaha Seca II--the second one. Over the years I’ve had eight motorcycles, all of them street except for two early Yamaha Enduro Models (AT-1, CT-1) and the most recent one. 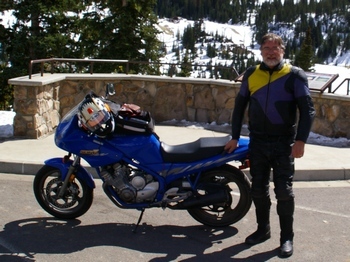 After a several-year absence, I began riding again in 1992 on a Yamaha Seca II, a 600-cc sport/touring bike I called “the sports bike for those over 40.” It was crashed out from under me in 1994. After a brief delay (two weeks), I was out looking for a replacement. I settled on a 1994 Yamaha Seca II, discovering that all the reasons I bought it in the first place still made sense. I still have that bike 20 years later (see photo). 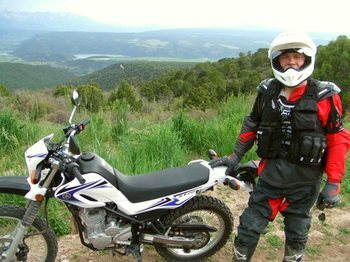 Last May I purchased a 2009 Yamaha XT-250, a “dual sport” bike, meaning a street legal dirt bike (see photo). The point is that I can ride from home to where I want to ride–I don’t need a trailer and all that goes with it. Here I am on Ouray County Road 4 with Pleasant Valley and Log Hill in the background. Oh, I did love that Yamaha XT-250, but sold it in early 2014. The bike and I had a wonderful five seasons together (oh, yeah, there was the little matter of the accident in April of 2013). You’ll find many posts and videos on this site that found their genesis on that bike. 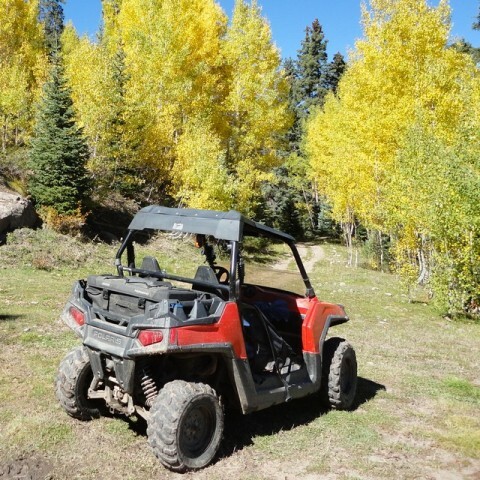 In late 2013, I bought a used Polaris RZR. It can go many places the XT-250 couldn’t (and vice versa). I also joined a local ATV club and have been on many rides with the club and with friends. In fact, these days, I really prefer going with someone rather than going solo. Our new (to us) Polaris RZR 800 two-seater side-by-side. Now Loretta and I can go riding together! Hi Dave, I did a search uncompahgre + single track and found your site. Very nice!